I haven’t been seeing many beggars around lately, except for the LKF Plastic Bag Lady and possibly the Wanchai Homeless Beggar whom I think I spotted in Lan Kwai Fong the other night. However, I did see a rather upbeat and jolly beggar a few weeks ago in Tin Hau just outside the MTR station on King’s Road. He had picked a good location, since sizable crowds would gather while waiting to cross the busy intersection. 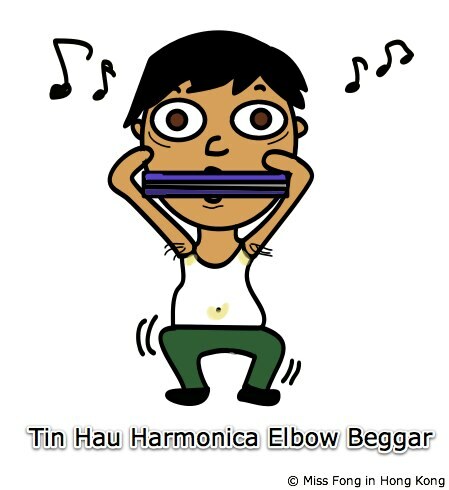 At first glance, the Tin Hau Harmonica Elbow Beggar (you’ll understand the name soon) looked like a normal person who was just playing the harmonica out of his elbows (a way to get attention perhaps) but upon closer inspection, I realised that he didn’t have any forearms — just little stumps after the elbow joint. While playing his tunes, he was also side-stepping to the music and grooving along, not to mention making eye contact with everyone who passed. It was pretty cool to see a beggar getting so into it, unlike the more dormant types like the Mong Kok Tree Trunk Stumps Beggar or the Wanchai Parma Ham Leg Beggar. Keep it up, dude! Excellent staff and really nice blog of Harmonica. Keeps it going! I just ordered my Suzuki harmonica at PIJ! I’m excited! I’m going to have these in week!